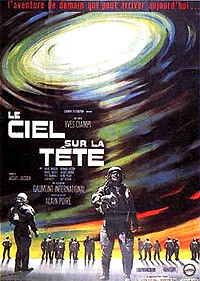 Le Ciel sur la Tête (1965) - Sci-fi-central.com. France / Italy  1965  105m   Directed by: Yves Ciampi.  Starring: André Smagghe, Marcel Bozzuffi, Henri Piégay, Bernard Fresson, Jacques Monod, Yves Brainville, Guy Tréjan, Jean Dasté, Beatrice Cenci, Yvonne Monlaur, Roger Van Mullem, Wladimir Bellin, Jacques Santi.  Music by: Jacques Loussier. The crew of an aircraft carrier discovers that it is being pursued by a UFO that turns out to be a radioactive probe from outer space. They appeal to the warring countries of Earth to stop fighting and help it to repel the invaders. The plot is simple: a naval aviator leaves his girlfriend in Paris on an urgent call to his carrier, something big is in the making, is it the Russians? Eventually the threat - from outer space - is repelled and the pilot returns home. I saw this movie as a teenager, in Poland, I remember the uncanny realism of the way the story was told, the direction was restrained, concentrating on "facts". There was stark contrast between the suspense of the hunt for the unknown enemy and the daily life of the people in Paris, unaware of the drama at sea. I remember leaving the theater, looking up, making sure it was all just a movie.... I've been trying to see this film ever since - in theaters, on VHS, DVD - without success, it seems all forgotten and neglected. Review by Mark from the Internet Movie Database.